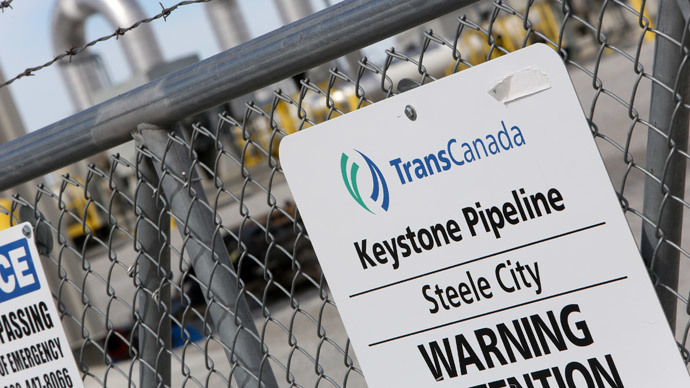 The Supreme Court of the state of Nebraska has overturned an earlier ruling that had until now held up construction of the controversial Keystone XL pipeline. Early Friday, the state’s highest court reversed a lower court’s 2012 ruling that had previously determined that Gov. Dave Heineman's decision to approve a path for the pipeline had violated Nebraska’s constitution. Now with the high court’s blessing, construction of the pipeline may soon proceed through Nebraska, pending how lawmakers in Washington, DC handle the project on a national level. Last February, Lancaster County Judge Stephanie Stacy struck down Gov. Heineman’s approval of the pipeline route, saying that jurisdiction over such a decision belongs to the pertinent state regulator, the Nebraska Public Service Commission, or PSC. Heineman filed an appeal, however, and the state’s Supreme Court said Friday that the governor had, in fact, acted within his authority. The state’s top justices voted 7-4 on Friday to strike down the earlier ruling, according to The Hill. "This appeal is not about the wisdom or necessity of constructing an oil pipeline but instead is limited to the issues of great public concern raised here: which entity has constitutional authority to determine a pipeline carrier’s route and whether L.B. 1161 comports with the Nebraska Constitution’s provisions controlling this issue,” the high court concluded, referring to the bill passed by the state legislature in 2012 that had allowed “major oil pipeline” carriers to bypass the regulatory procedures of PSC. Lawmakers in the House of Representatives are slated to give their approval to the project on Friday, paving the way for the Senate to consider legislation as early as next week. A Republican majority in both chambers means a GOP-centric Congress will likely authorize the pipeline project, but the White House warned recently that US President Barack Obama would veto a decision if it runs counter to the State Department’s findings on the proposed pipeline. Sec. of State John Kerry is expected to announce his office's findings in the next few months. Republicans have attested that green-lighting a pipeline route out of Canada and through the US to the Gulf of Mexico would create upwards of thousands of new jobs. Environmentalists have largely rejected the project, however, and the president said last month that he disagrees with the GOP with regards to the rumored impact congressional approval would have on the economy. “At issue in Keystone is not American oil. It is Canadian oil that is drawn out of the tar sands in Canada,” said the president. “That oil currently is being shipped out through rail or trucks, and it would save Canadian oil companies and the Canadian oil industry an enormous amount of money if they can simply pipe it all the way through the United States down to the Gulf,” Obama added, calling the pipeline "not even a nominal benefit for US consumers."